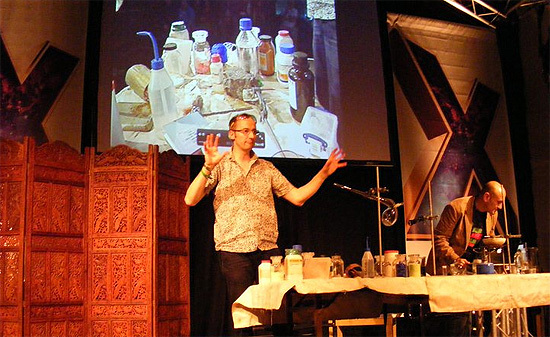 1001 Inventions will be showcasing a unique event at the Times Cheltenham Science Festival bridging the historic overview with real timedemonstrations of the science behind themulti award-winning film ‘The Library of Secrets’ -both physics and chemistry. Prof. Jim Al-Khalili and Dr. Andrea Sella are on hand to introduce a sold-out crowd at the Cheltenham Science Festival to the history of science from the Middle Ages, in Muslim Civilization, that has a huge but hidden impact on modern science. The award-winning educational film "1001 Inventions and The Library of Secrets" starring Oscar-winning actor Sir Ben Kingsley in the role of The Librarian is part of the world-renowned "1001 Invention" global touring exhibitions. This astounding movie provides an eye-opening introduction to the 1001 Inventions brand and is the official introduction for the exhibition. View our YouTube channel to watch the original film in widescreen HD.